This report is missing crucial information, from May this year, on scientifically produced estimates contradicting the mere ‘expectations’ of anonymous ‘prevention experts’ and illustrated in the graph above. This is classic propaganda and bias by omission. It’s quiet and slips smoothly into the subconscious mind like a hypodermic needle. BBC Scotland know of the research by Laura Webber of the London School of Hygiene and Tropical Medicine because they reported on it, at the time, but only partially so as to obscure the Scottish Government’s role. I complained but got nowhere. Next Article A trillion cubic feet of gas found in Glendronach! Had a wee peek at Professor Bauld’s background after reading the BBC web article this morning. It appears that she is not a ‘medic’ as such but has been a leading light in the UK on anti-tobacco campaigning. From the nature of her published work it would seem that the obesity problem has occupied her attention only very, very recently. Her exhortation of the Scottish Government to ‘do something’ indicates an unawareness of what is in train or has already been done by that same SG. Your conclusion that this is an early-morning propaganda piece, in my opinion, is not wide of the mark. It is noteworthy how quickly this ‘story’ has been demoted on the BBC Scotland page. The baleful ‘fat-shaming’ photo which is at the top of this piece has been changed to a much more reassuring photo of a woman having a consultation with a doctor. What Professor Bauld is quoted as saying is “While the results of this study focus on the UK picture, unfortunately the forecast is expected to be similar for women in Scotland.” Note that she says that it as a “UK picture” and that she then – quite wrongly and unprofessionally for someone who is an academic researcher and a BBC proclaimed ‘expert’ – ‘it is ‘expected’ to be similar. So the story is based on a speculation. 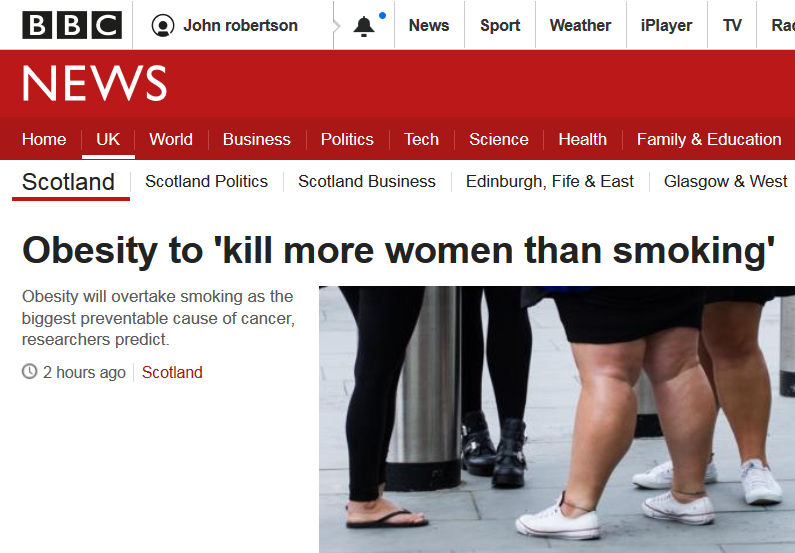 While the BBC Scotland site led with the infamous photograph shown, there was no mention on the UK site, despite it being a UK study. Cancer Research – a charity to which I donate – is seeking to make a point and, like other charities can often state arguments in headline grabbing terms. Personally, I have concerns about the efficacy of that approach by a wide range of charities, but, sadly, it is the ‘shock-horror’ soundbites that get the publicity. You’d think Prof Bauld might have read previous research on the topic and, as you say, avoided guesswork. Just looked at the BBC article again (at 1530) and as well as being minimised on the web page it appears to have been substantially edited. Maybe someone at BBC HQ is monitoring “Talking Up Scotland”. It has in fact disappeared entirely from all the BBC Scotland web pages. It appears only on the UK Health page as the fifth item out of 12. The main item is the enquiry into the ‘infected’ blood transfusions. GMS tired to present this as a particularly Scottish problem. Again, this is cynically taking advantage of the horrific experiences of people who were infected to score some cheap political points. This story never even featured on the Northern Irish or Welsh pages of the BBC site. Given the projection for Wales compared to Scotland or England, there might have been some grounds for it being mentioned. Clearly, BBC Scotland was continuing to play it’s ‘Scotland is pure shite’ record.